As my main area of research is with the Leicestershire and South Staffordshire Regiments, I was recently looking further into the 46th (North Midland) Division. Without giving the complete history, I thought I would give one or two important little snippets of information. It was originally formed in 1908, known then at the North Midland Division and was one of the14 Divisions of the Territorial Force. When the war broke-out the Division was under the command of Major General Hon. E.J. Montagu-Stuart-Wortley. He is an interesting character, and disliked by Field Marshall Sir Douglas Haig. His story will come later. All units were mobilised on 5th August 1914 and converged in the Luton area by the middle of August. After the King had inspected the troops (19th February 1915) they set off for France and The North Midland was the first Territorial Force Division to arrive complete. On 12th May 1915 the Division was given the title 46th (North Midland) Division. They first went to the Ypres Salient where they experienced the German liquid fire attack at Hooge on the 30th and 31st July. The Division then moved south into France eventually taking part in the attack on the Hohenzollern Redoubt where, on 13 October, the Division was decimated. There was much to-ing and fro-ing to Egypt and back in early 1916 and the Division was later involved in the Battle of the Somme (1916) on the failed attack at Gommecourt, 1st July 1916 and the Battle of Albert (1st – 13th July 1916). On 29 September 1918: The Breaking of the Hindenburg Line. This brings me to my recent visits to the Redoubt and to the two memorials to the 46th (North Midland) Division, near in Vermelles. 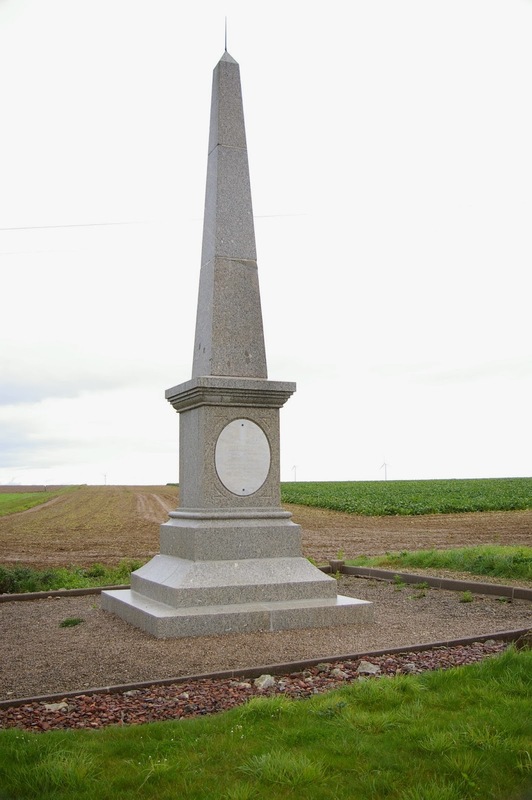 The memorial honouring the casualties of the 46th Division at the Hohenzollern Redoubt, which is where the German front-line was, is worth a page of its own; please click here to read all about it. It is on the opposite side of the Hohenzollern Redoubt at Auchy-les-Mines. Also on the Vermelles Road at Haisnes just behind the British front line is the St Mary's Advanced Dressing Station Cemetery where Jack Kipling is buried – lots of controversy there. Thanks, very interesting, having just come back from the Somme myself. Pleased you enjoyed reading and thank you for leaving a comment. Maybe a trip to the Loos Battlefield next then? Hope you saw the Best Billet on the Somme too.